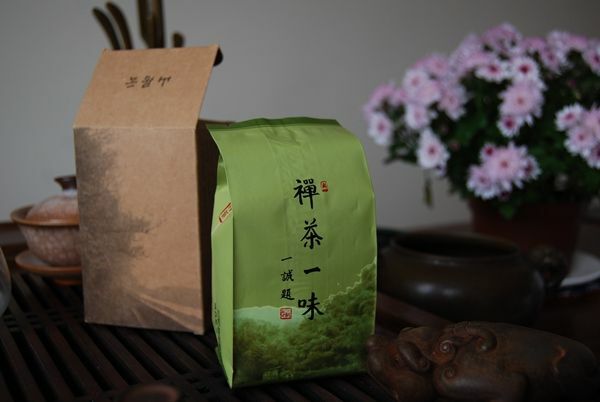 When I first started drinking pu'ercha, I received some wisdom from a tea-shop seller in Chengdu: "drink shupu in winter, drink shengpu in summer". As regular readers may have come to appreciate, I promptly disregarded this advice. Lately, however, it has been baking hot in England, despite it being only April. For the first time in as long as I can remember, we had an Easter barbecue and I developed a fetching sunburn. Certainly, our climate is not on the same scale of that in central China or Arizona, but, for we feeble race of fog-dwellers, it is the hottest temperature imaginable. It feels as if my eyeballs are going to melt. Have you ever come across something by the name of "Xikong" [shee kong] before? 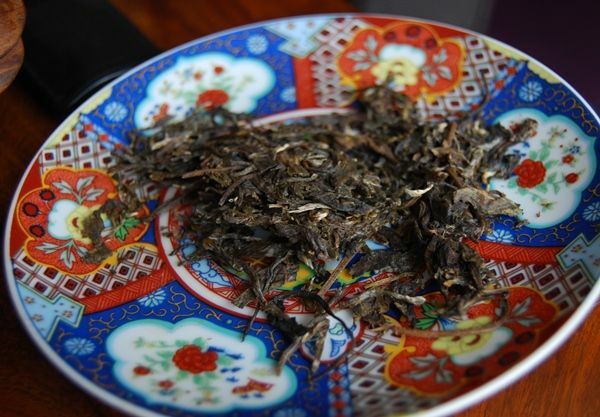 It is entirely new to me, and again reminds me just how delightful it is, and how fortunate we are, to be able to sample leaves from around the less-travelled parts of Yunnan province. Xikong is kinda-sorta in the Yiwu region, being in Mengla County of Xishuangbanna, which is the bit that sticks out into Laos. As such, I expect a little "outlying" character to be found, and this excites me: I completely adore the unique granary, sweet characteristics that I associate with that area. If more cakes came from this region, I would be a happy drinker - and I am, by dint of nature, a habitually happy drinker. 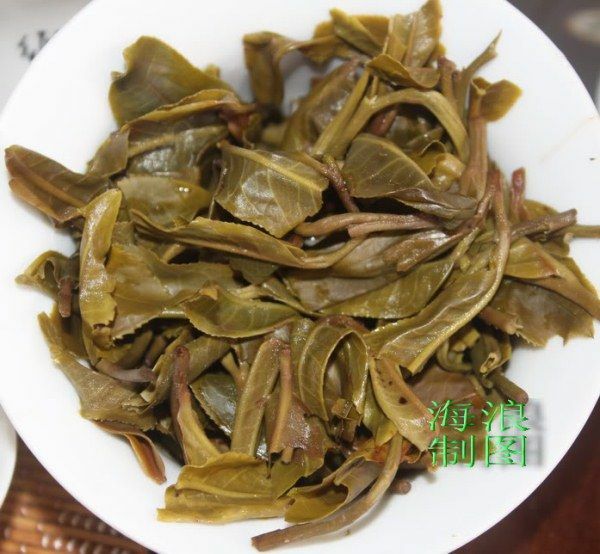 The varietal that grows around this area is a xiaoye [sheow yeah, small leaf] type, which I find to be a touch more fruity and sweet than the usual daye [dar yeah, big leaf] type. So, then, to the tea itself. Scott's samples always take me by surprise when I unseal them from their tightly-packed little foil pouches: the aroma leaps out and wrestles the nose into submission. 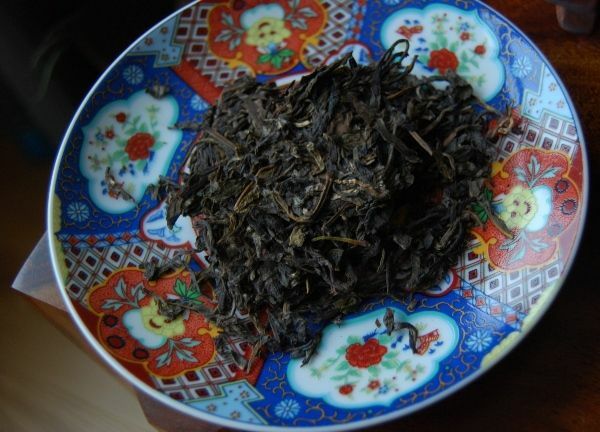 This Xikong is grassy and fresh in its scent, and could have easily convinced me that it is a springtime tea, rather than the autumnal growth that it is. You can see from the image above that the leaves are, indeed, of a small variety. Happily, this is a straight yellow tea (pictured above). 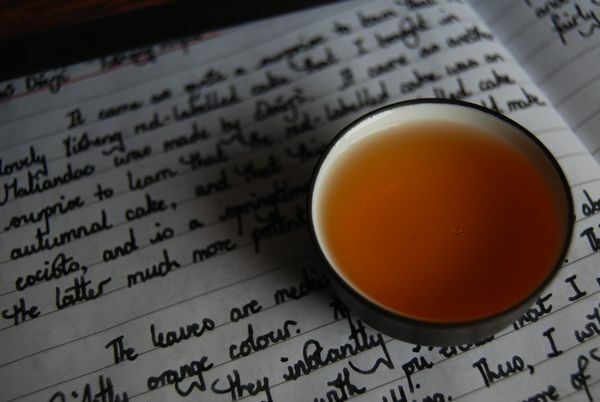 I have consumed, it seems, so much one-year tea that turns out fat, husky orange, that to have something unadulterated and properly raw is quite a relief. Further encouraging me, the scent marches proudly in the aroma cup, long and strong, with no sign of diminishing as the infusions continue. Happy days: this is a fine example of the region's tea. Sweet, grapefruit-like, with a goodly amount of smooth buttery, sweetness in the finish paint a complex picture for the drinker to appreciate. It squats determined in the throat, with an excellent kuwei [bitter flavour], and a satisfyingly fat, chunky body. I could drink this until the proverbial cows come home, and thoroughly enjoy a prolonged session with it. Scott sells two strata of autumnal cakes: a cheaper layer, costing around $20 / 250g xiaobing, and a more expensive layer, costing around $40 / 250g xiaobing. This cake is in the latter, and deservedly so. Of course, its equivalent 375g bing price is around $60, which makes one pause for thought - that isn't the sort of money that I would spend on a one-year cake without significant consideration. However, it is a lovely tea, and it appeals to my idiosyncrasies. I hope to buy one or two cakes for fun. I was unsuccessful in buying this from Yunnan Sourcing, where it quickly sold out. I should learn to buy before I write! I since bought it from a stock that Scott had reserved for his US venture. The price was higher, in the $50s somewhere. This time, with my own cakes in hand, I find it sweet and buttery, with a dry, granary body. It has good potency and endures well. It keeps my interest, and I find it absorbing - surely a compliment. I enjoy its sweet, rough nature. 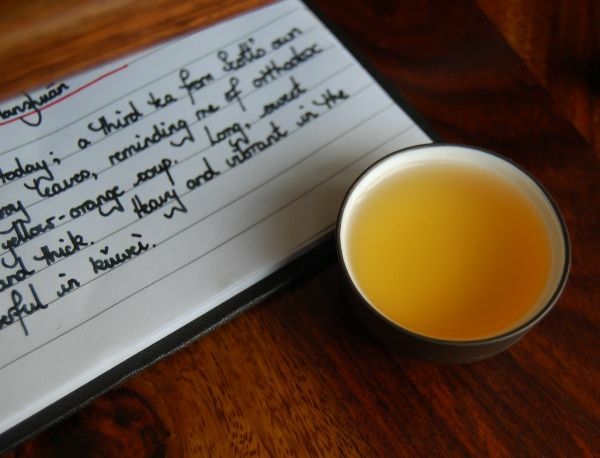 This tea has been given as a gift three times, and is rather special. A friend of the (Chinese branch of our) family happens to be an architect, who performed some work for Zhenru Chanshi [Zhenru Zen-Temple], in Jiangxi province. This is, in itself, one would imagine, "good karma". 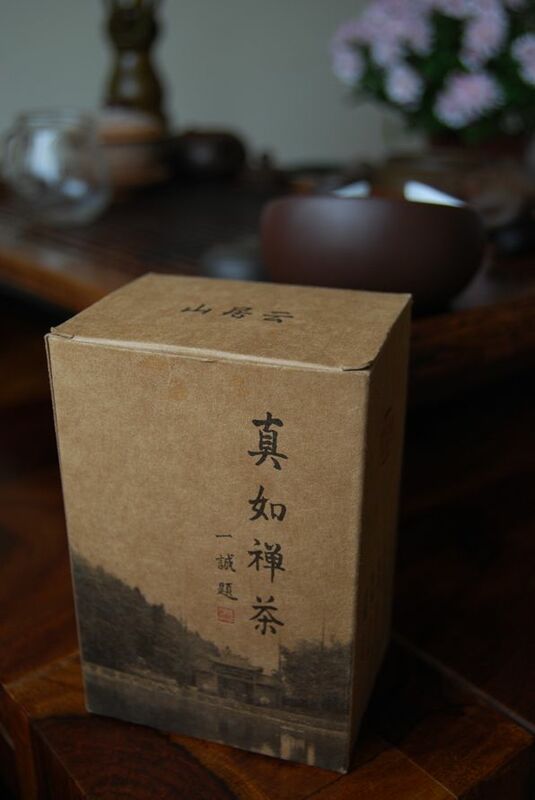 "Chan Cha Yi Wei" - "Tea Zen, One Taste"
Pictured above, the interior package reads "tea, Zen - one taste", which has become one of my favourite little sayings. We often associate Zen with Japan, and yet it is sometimes easy to forget that the first 700 or 800 years of Zen (a.k.a. Chan) took place in China*. Indeed, Zen/Chan became the dominant form of Buddhism in China during the Tang and Song dynasties, making it live comfortably alongside Daoism and Confucianism as China's effective national philosophies. Most modern Zen Buddhists these days identify themselves as being either Soto or Rinzai, yet these are actually 9th-century Chinese schools: Caodong and Linji, respectively. The Japanese names are merely transliterations of the characters. I remember that the first cakes from Nadacha (predating Essence of Tea) were named after this phrase, and I was pleased to see the same phrase carved into the mantel above a charming tea-house in central China. *If we take the start of Zen/Chan to be the teachings of Daruma/Damo/Bodhidharma, acknowledging the supposed "lineage" of 26 patriarchs between Bodhidharma and Mahakasyapa, the latter being he who famously smiled at Buddha's twirling flower. Zen bookishness aside, the photographs of the Zhenru Temple on the box convey a sense of peace and solitude. "Zhenru" itself is a Buddhist phrase meaning, approximately, "intimate understanding of reality". The temple was built on a mountain now named "Yunzhushan" [cloud-dwell mountain], in Yongxuxian [forever-practice county] of Jiangxi province, well within lucha territory. That pungent aroma is of sweet candy, yet seems naturally sweet. My seldom-used gaiwan gets a turn at the tea-table once again. How surprising is the vivid green of the soup! It is almost fluorescent. The sweet, candy-like aroma remains in the aroma-cup for what seems like an age. In texture, it is thick and gloopy; in flavour, green, vegetal, and sweet. Unlike many lucha, it produces a strong, mouth-watering ending in the throat that tends towards that which I love so much in good pu'ercha. Like good pu'ercha, it has a pronounced cooling sensation in the mouth, indicative of the excellent quality of the leaves. 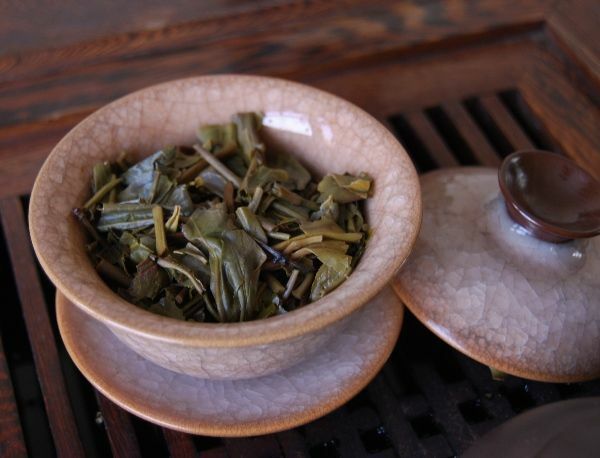 A hint of Biluochun creaminess, a hint of Longjing roastiness. I feel particularly grateful to the three gift-givers: the abbot, the friend, and the cousin. 2009 and 2010 Yunzhiyuan "Manzhuan"
You will soon notice, if you have not already, that I have been going on a binge of drinking samples from Yunnan Sourcing. This is an effort to find out how the difficult, drought-prone 2010 season affected Scott's range of cakes, before his 2011 range come out. Spring and summer are always exciting times in the world of pu'ercha. I want all of these cakes to be good. 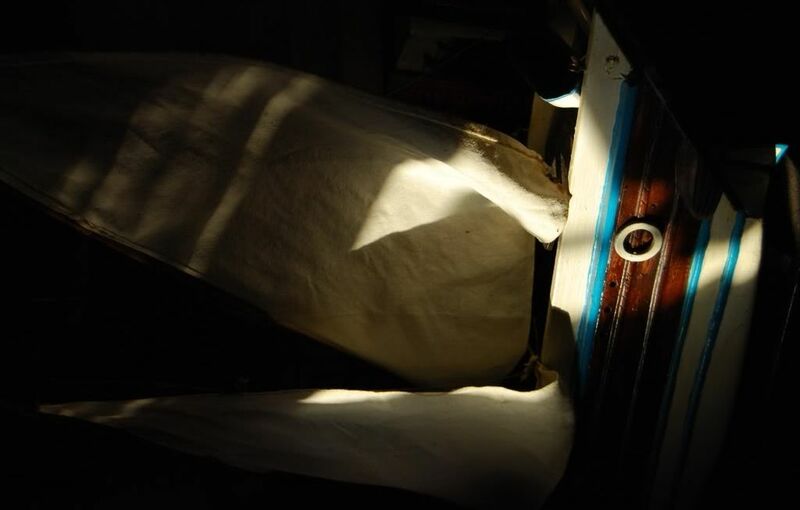 The sentimental value alone is high, given that they have been hand-selected by someone that has been instrumental in the Western-oriented market for pu'ercha. How much can reality live up to my hope and expectations? I have tried these two versions of the same family's produce at different times - perhaps almost one month apart. However, they are very similar. If anything, the 2009 version has a little more to say, but it is a close-run contest. The 2009 cake is $53/375g, while the 2010 was $35/250g - almost exactly the same price, per unit weight. Both are autumnal teas, which is an interesting choice. Perhaps Scott can only travel in the autumn. The rinse from both is a yellow-orange colour, which looks healthy. 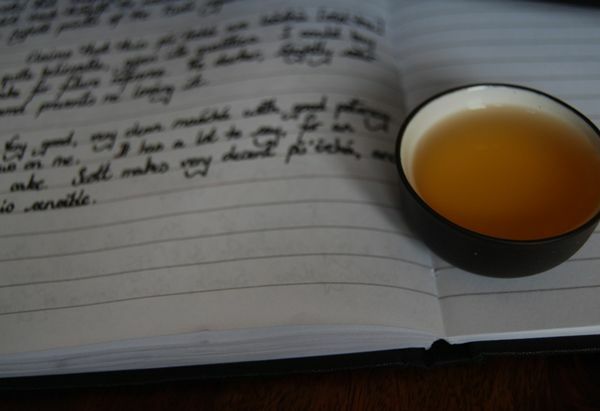 Tell-tale signs appear in the aroma cup: it opens a little thin, before building into a thick, sticky sweetness. They are much the same in the mouth: an active, yet light, opening, which builds into a mouth-watering crescendo. Scott wrote that he noticed a "chocolate-like" aftertaste. I can approximately see what it is that he might be referring to; I would instead describe it as the particulate, slightly sour aftertaste that I associate with heavy green vegetables, such as broccoli. They are clean and clear, as with the majority of Scott's cakes, but... these Manzhuan cakes really don't seem to wish to be consumed. They are highly unfriendly, vacillating between overly vegetal/sour and slightly empty. So, then, what do we conclude? I would have put my fairly negative experience with the 2009 Manzhuan down to a bad session, if it were not for experiencing the same again with the 2010. 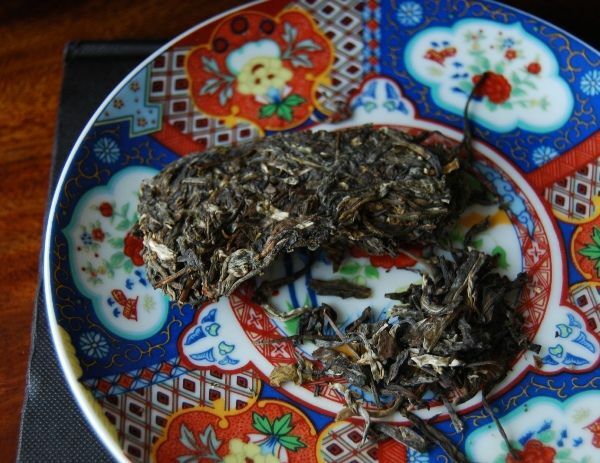 There are some lovely examples in the Yunnan Sourcing hand-selected range, but I found this pair to be unenjoyable. You know what I'm going to say here, so let's get it over with. This cake costs $220, at the time of writing. This is the single most expensive (unaged) cake that I have ever encountered. This is, therefore, a rather special encounter (for me, anyway). I devote a few hours on a calm Saturday morning to exploring this remarkable cake. I previously likened Hailanghao to the bowels of Pandemonium, that infamous city where the fallen angels set up shop. This is because I believe that Hailanghao attempted to step up into the "premium" brand bracket, after successfully making chunky, fun cakes that represented the top of the mainstream bracket - but they did so without a particularly great increase in quality. Or, perhaps rather more accurately, the prices that were being asked for Hailanghao after a certain point in time rapidly diverged from the actual quality of the tea. This cake represents the zenith of this particular divergence. Indeed, it represents the zenith of all unaged pu'ercha pricing that I have ever encountered - Internet-based, Maliandao, Taobao, High Street shop. I alternate between Zidu ("purple belly", my usual pu'ercha pot) and Gertrude (my celadon gaiwan), simply because I hadn't tidied the latter away following my recent Yisheng sessions. The dry leaves are surprisingly compressed - my 10g sample comes from the centre of the bing, and the leaves are small and heavily fragmented. 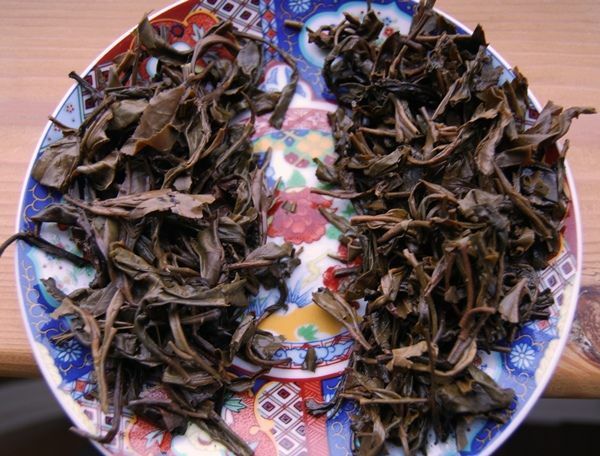 This is at odds of the photographs at Yunnan Sourcing, where it is being sold, which show large, deluxe leaves. The aroma is - unsurprisingly - minty in the extreme. It has a long, constant sweetness that sits in the aroma cup without dissipating. 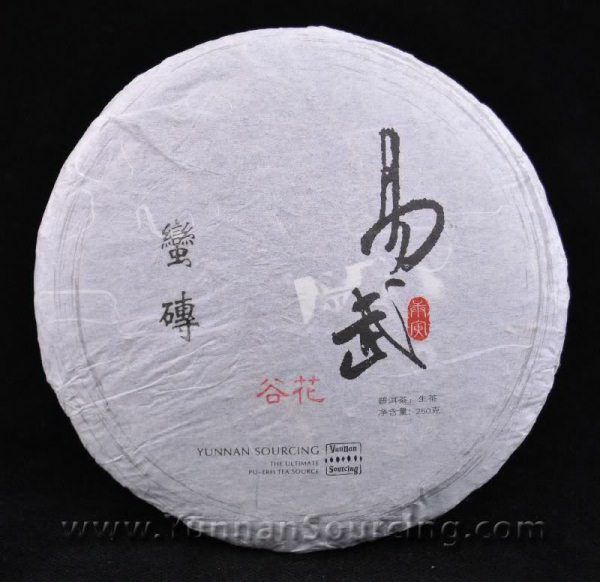 In the mouth, the first impression is the quick, high fruitiness - springtime, lively, enjoyable. The minty body then rapidly asserts itself. These leaves are, undoubtedly, laoshu to a great extent. 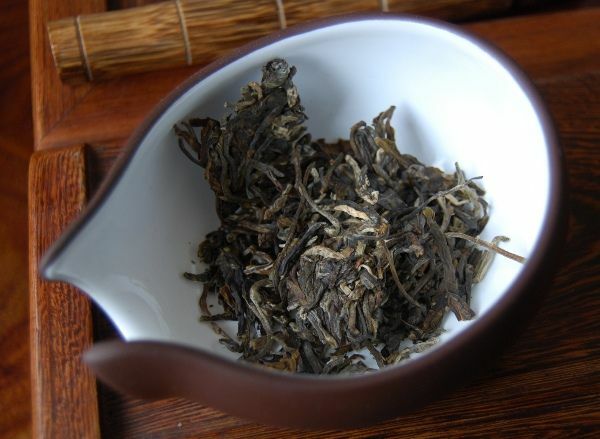 The blurb on the merchant's web-page describes it as being 100% laoshu, picked under the supervision of Hailanghao's owner. This could, for once, be true. It's like drinking mint. Within minutes, my nose is entirely clear, and I am breathing cold blasts of menthol air through each nostril. This is an interesting tea. I am glad to have tried a sample, but I cannot say that I actually enjoyed it a great deal. There is a sour note that dwells in the body that stops me from falling in love, and it is rather monotonic. 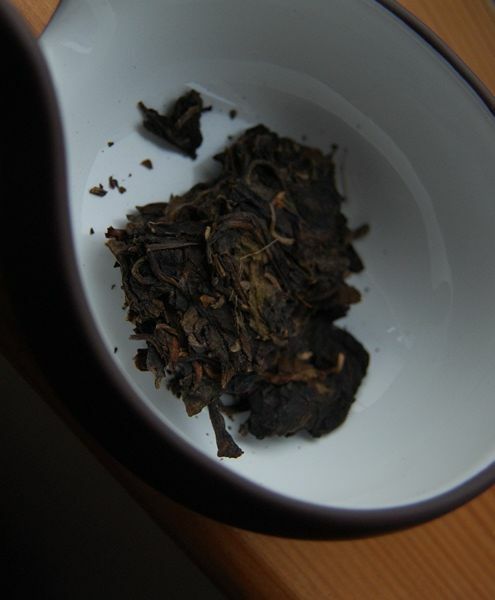 Unlike other pure laoshu that I have tried from Laobanzhang and Xinbanzhang, it isn't particularly charming. My dear wife passes by and grabs a cup: "This is quite simple", she notes. 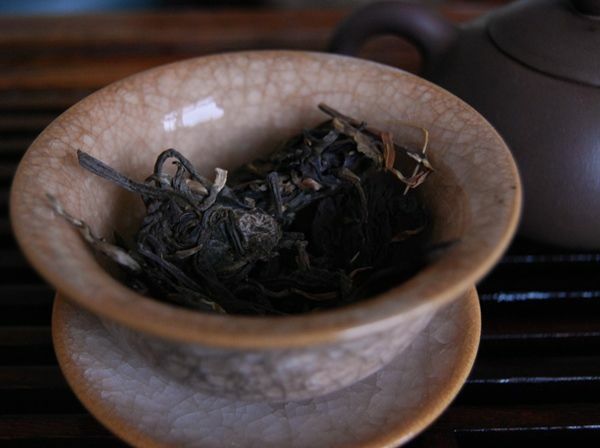 While it does have plenty of laoshu characteristics, it is entirely one-dimensional. 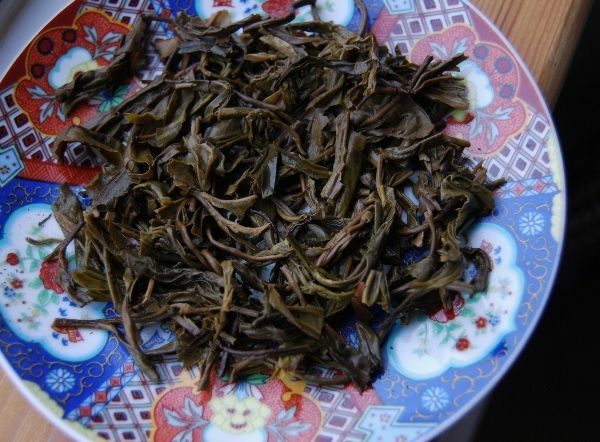 Whereas the previous laoshu banzhang leaves that I have tried have been one-dimensional (because they come from a single source), that one dimension has been clean, leathery, sweet, and buttery. By way of contrast, this Hailanghao's one dimension is more of a straight, sweet sourness with little more than its menthol character to commend it. Its provenance is not in doubt, but provenance alone does not necessarily a good cake make. 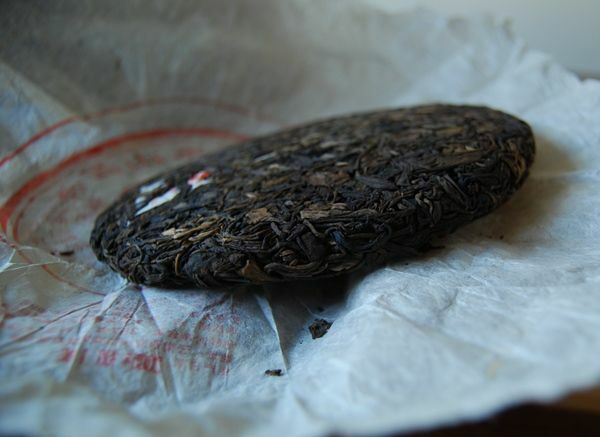 So, at the end of it, I am grateful to have had the opportunity to buy a single session's exposure to another example of Laobanzhang leaves, but, in this case, I am left with the impression that is how one should not make a laoshu bing. 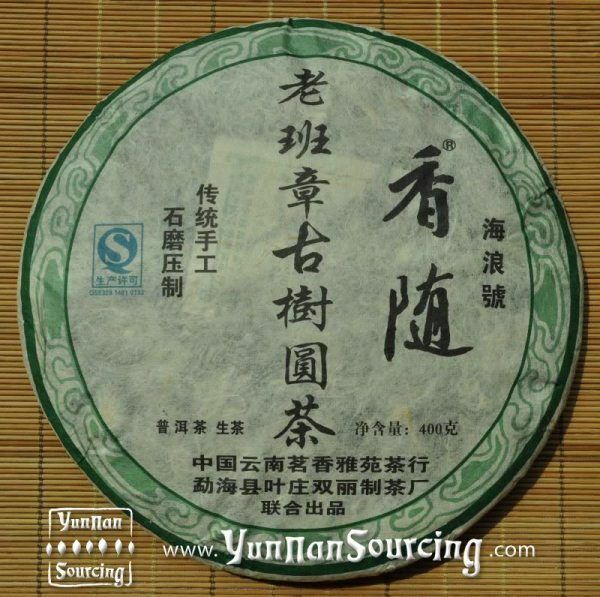 If you happen to be the proprietor of Yunnan Sourcing: I appreciate your store very much, but please look away now. 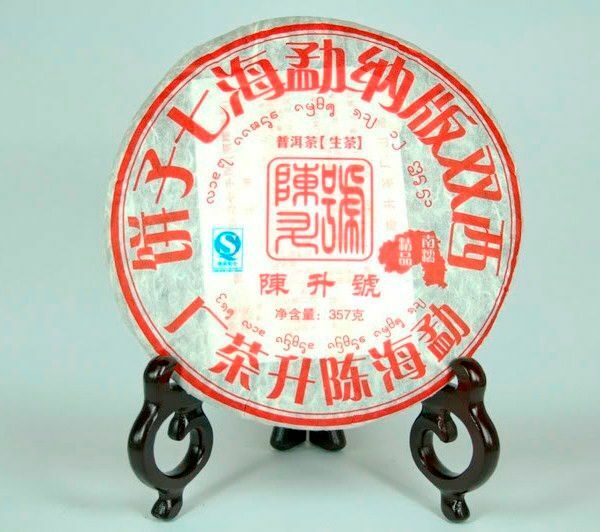 For the rest of us: $220 for this cake (1,400 RMB!) 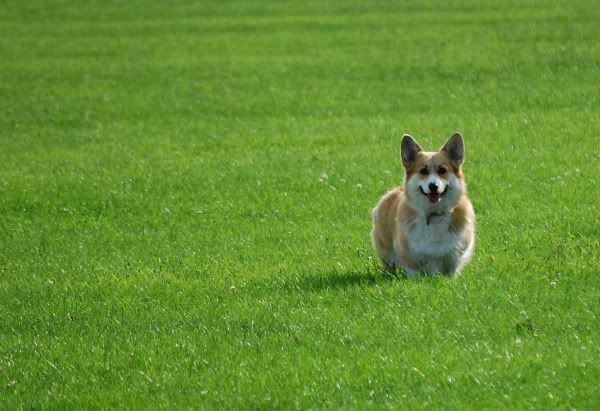 is, I am afraid to say, barking mad. 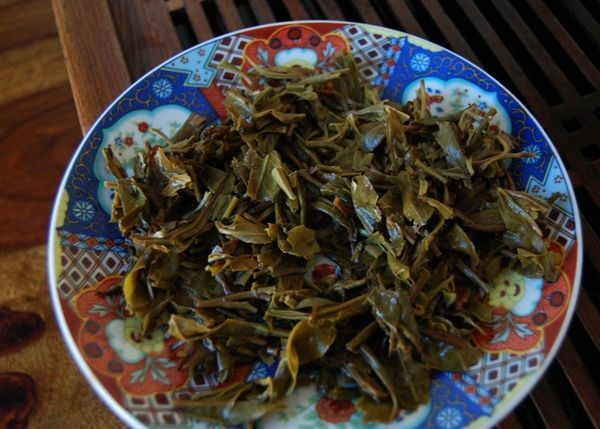 I think we tea-drinkers are very fortunate to have Yunnan Sourcing. If we were to go back, let's say, 15 years, where would be Westerners get our pu'ercha? Whittards of Chelsea? The only thing I've ever obtained from the latter is the unbearable lightness of my wallet's being, and a disgruntled feeling after consuming their substandard, treacle-pudding flavoured hongcha. By contrast, the mighty "YS" has been around for quite a long time now, originally pumping out mainstream brands to we foolish Westerners who seemed to like pu'ercha, but, more recently, broadening the range to cover more interesting and unique cakes. I admire the dedication of a man who moves to the Chinese mountains and "lives the dream", allowing us mere mortals to enjoy a little of the vicarious pleasure that trucking around Yunnan must bring. 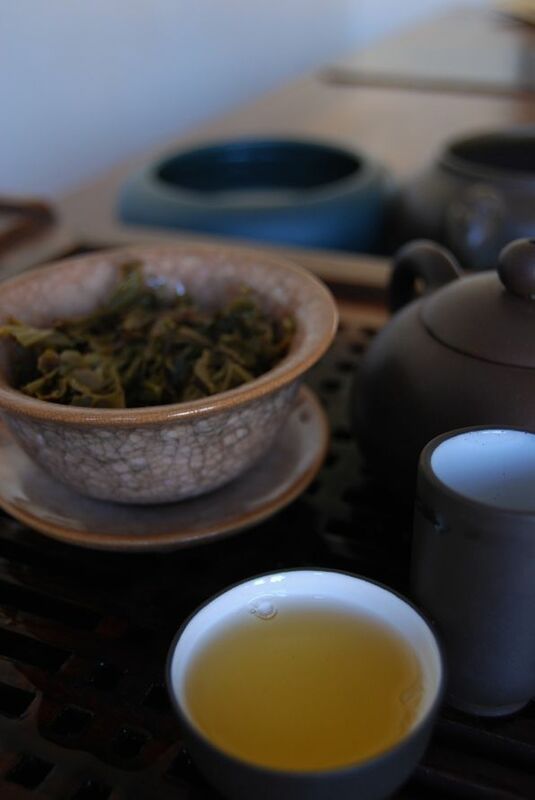 Since 2009, Scott has been visiting tea farms, buying maocha, and having his own cakes pressed. Quite a few of the 2009 range were entirely delicious - I remember the 2009 Guafengzhai as being particularly good. 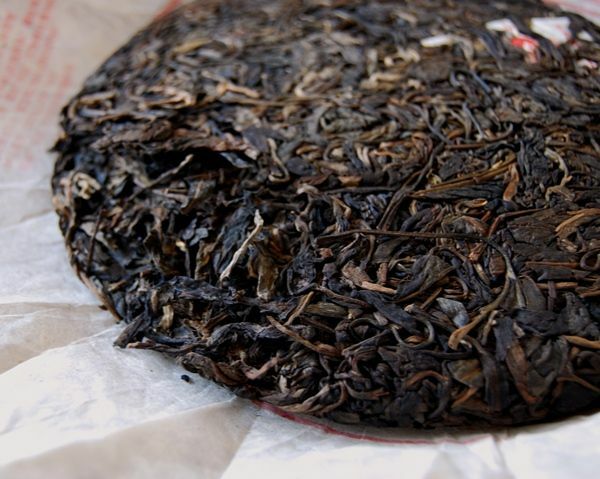 Through accident of time and habit, I haven't tried anything from Yunnan Sourcing for over a year, and the 2010 range of Scott's cakes slipped past me entirely. Shown above, a map of the Yiwu region. Scott has been in and out of many of these villages, pressing cakes for his "Road to Yiwu" series. I go back to my original (rhetorical) question: aren't we lucky? To have access to very decent cakes from these locations, produced by someone who knows his pu'ercha, at a very decent price is, I think, quite something. One could search Taobao for days and find nothing quite like it. 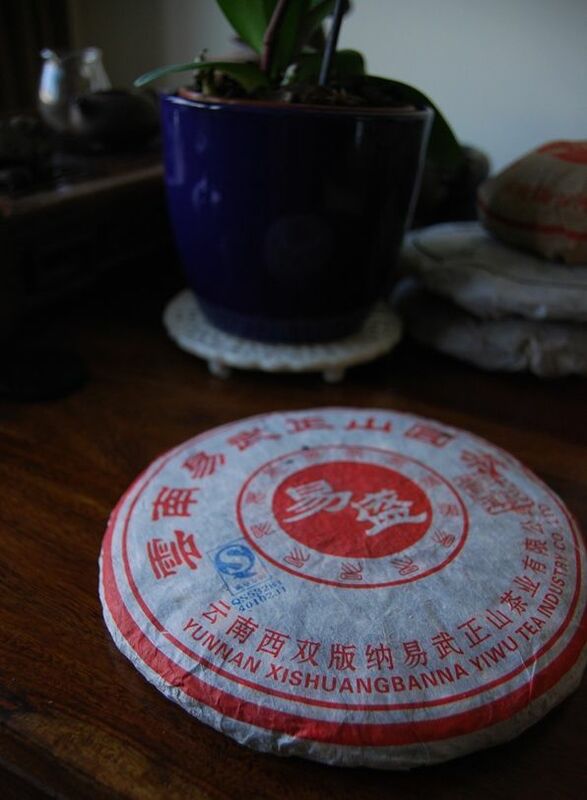 I am, therefore, rather positive about the notion of trying this autumnal-harvest cake from Wangongzhai [wan gong djai, "bend bow village"], a sample of which I recently bought from Yunnan Sourcing. From the map, we can see that Wangongzhai is just north of Guafengzhai, and south of Yishanmo. 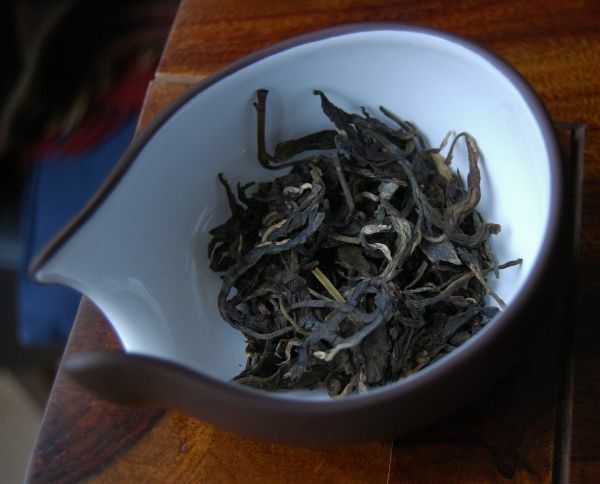 Scott notes that all three are among the highest regions in the greater Yiwu region. 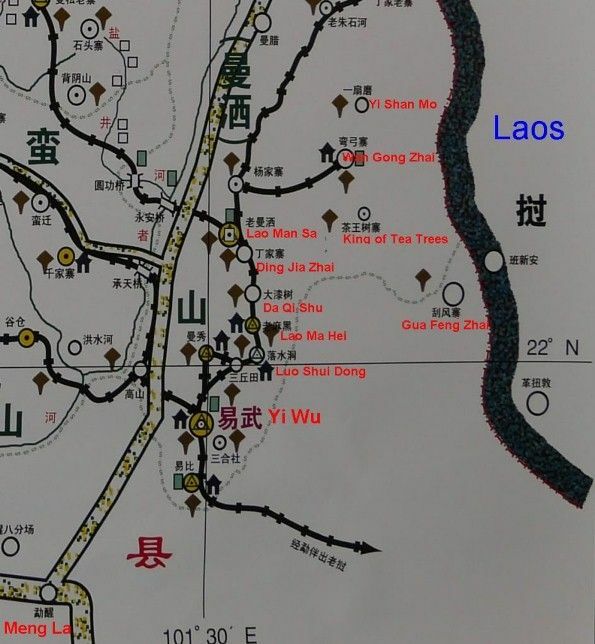 He also notes that it is rather tricky to reach Wangongzhai, it being accessible only by a 15km dirt track. This reminds me of the accounts given by Nada of Essence of Tea, when the latter produced his own cakes (from other regions, which regular readers will recall that I thoroughly recommend). The wrappers on Scott's cakes have taken a turn for the rustic and understated (pictured above), which I like just as much as the colourful, tasteful designs of his original 2009 range. This range of cakes seems to be 250g in size, and therefore we must multiply the $40 asking price by 1.5 in order to obtain the equivalent cost for a standard 375g bing, which would be a reasonable $60. 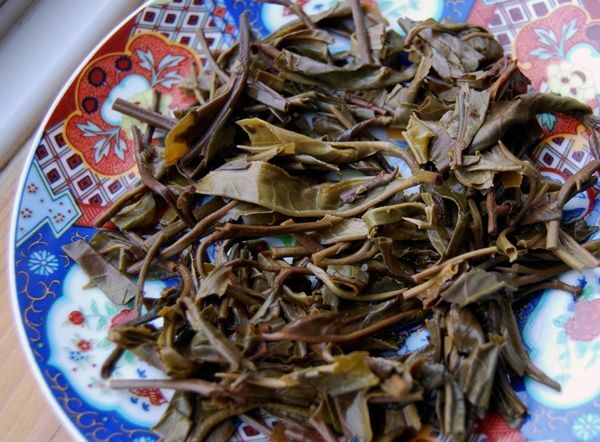 The leaves are well-handled, and smell entirely Yiwu-esque, in their fine sweetness, slightly buttery. This much-loved and, by now rather familiar, characteristic continues in the aroma cup, where the buttery finish lingers for a considerable time. My hopes are reinforced when my lips feel effervescent after touching the tea. I consider this "fizziness" on the lips to be indicative of good, active leaves. 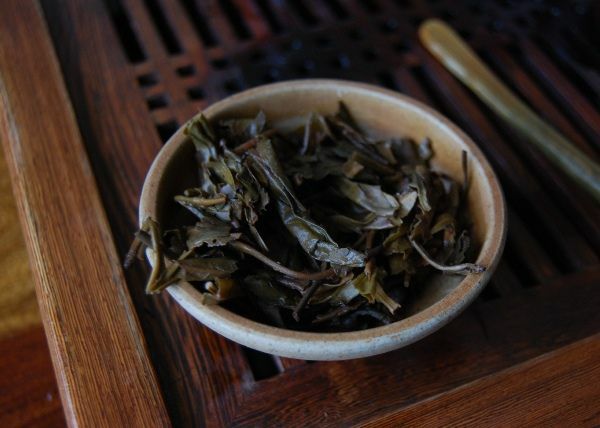 It is associated with a cooling sensation in the mouth, which again suggests that Scott's farmers have included at least a substantial component of laoshu [old tree] leaves in the blend. It is a very good, very clean cake with a potency that grows on me. It has a lot to say, for an autumnal cake, which is a pleasant surprise. I can see myself buying a single cake for future reference. "Leeeet's get readyyyy to ruuuuumblllllle." And, indeed, so we shall. In the red corner: the 2005 Douji "Yisheng" red-label (leftmost above). A spritely contender, allegedly less violent than its heavyweight counterpart, the 2005 Douji "Yisheng" purple-label (rightmost above), but still energetic and spoiling for a fight. Available from Taobao for around 350 RMB ($54), previously available at Yunnan Sourcing for a decent $59. In the other red corner, the defending middleweight champion of the world, the 2005 Laojie Yishenghao "Yisheng". Available from Taobao for around 800 RMB ($121), typical Maliandao price around 750 RMB ($114), bought by me from Xiaomei's apparently charitable little brother for the 2006 price of [redacted]. 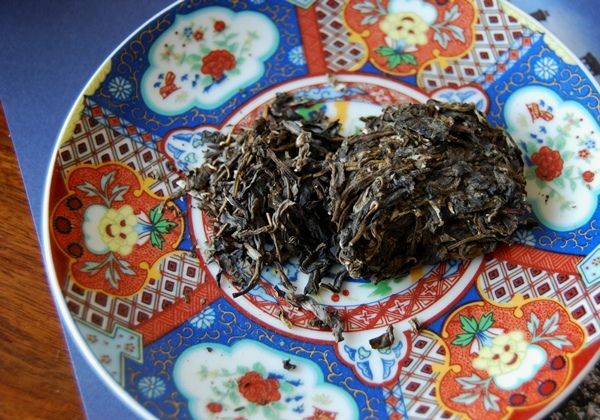 The Douji cake is made from small, fragmented, densely-packed leaves, as shown above. Like its brother, the purple-label cake, it has a very gentle aroma. 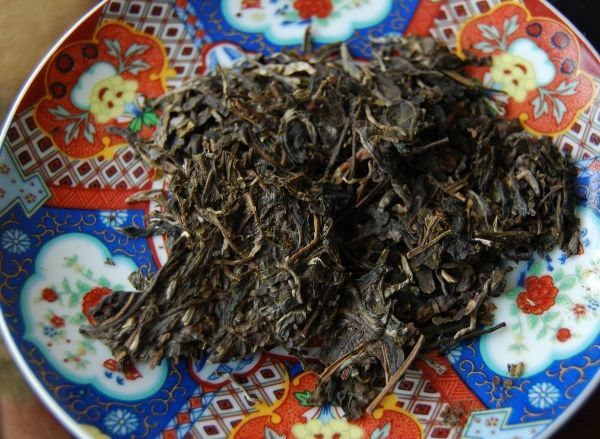 The Laojie Yishenghao, by way of contrast, flexes its long, luxurious leaves and shows its contempt for the crowd by issuing a potent, sweet aroma of chunky pu'ercha. Its compression is loose, its appearance entirely "bespoke". Round one goes to the Laojie Yishenghao. The Douji opts for Zidu, [purple belly], my prime pu'ercha pot. 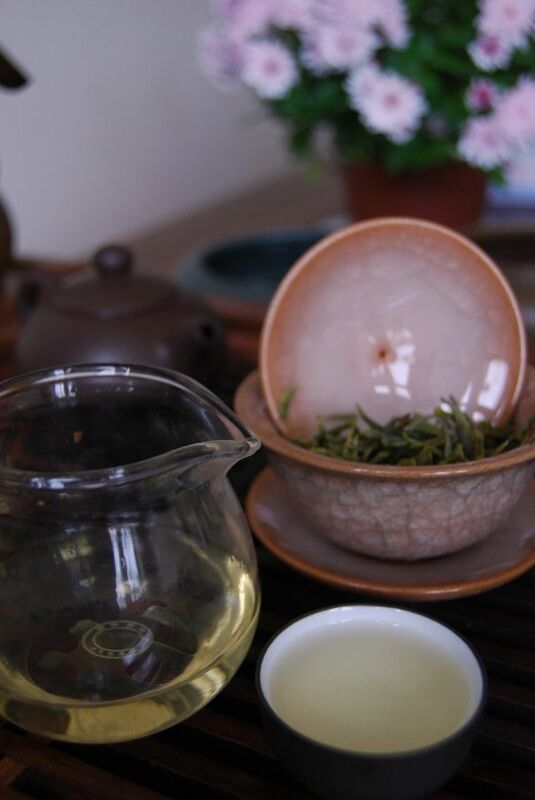 The Laojie Yishenghao heads for Gertrude, my celadon gaiwan, giving the underdog the better vessel. Nothing if not sporting. You might not think so given the above photograph, but the two contenders look rather different in reality. The Douji is clean, crisp, and heavily orange. Like its stablemate, the purple-label, it darkens noticeably as it sits in the air. 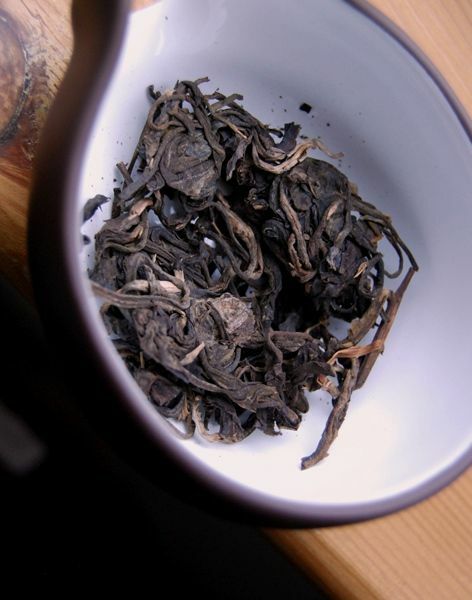 The Laojie Yishenghao is cloudier, and gradually approaches its meniscus, rather than having it as well-defined as the Douji. It has green-yellow tints in its orange, which reminds me more of "straw-like" pu'ercha. Left: Laojie Yishenghao, right: Douji. The Douji is very much like the purple-label version, minus the kuwei. It is camphor-like, decently heavy, and woody. Perhaps it is not quite as sharp as its purple-label brother, due to its lessened potency. It lasts well, and remains sweet and pleasant without cracking. Like the purple-label, it is not the thickest soup in the world, but it holds the attention nicely. 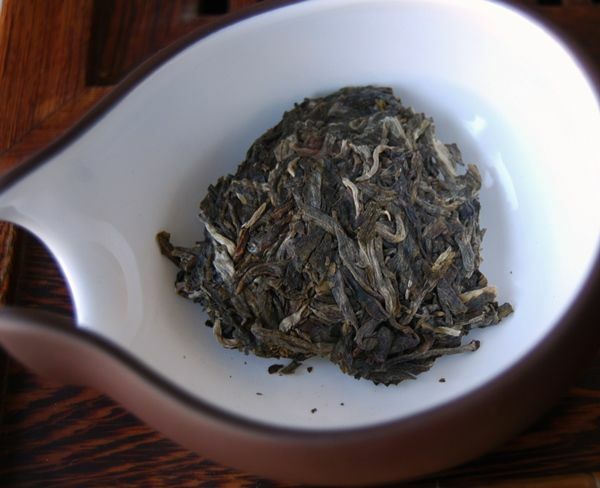 The Laojie Yisheng is a different kettle of fish altogether. It has a sweet straw-like vegetal character, and is significantly more complex. It has some camphor, perhaps not as much as the Douji twins, but successfully stretches out more in all directions: texture, body, aroma, chunkiness, endurance. The Douji has put up a good fight, but the Laojie Yisheng wins on points. It wasn't a knock-out victory, but there was a clear winner nonetheless. The "hand-made" quality of the Laojie Yisheng is markedly more than the very decent, but ultimately "factory-styled" Douji. While I don't know if I'd pay the current asking price for the Laojie Yisheng, it is certainly worth more than the Douji pair. I have a couple of Douji cakes on their way from a Taobao merchant, and so look forward to further rematches. As it is, I won't be buying any more of the red-label, because I prefer the pungent, potent, entirely more active purple-label. Both are very pleasant, however. 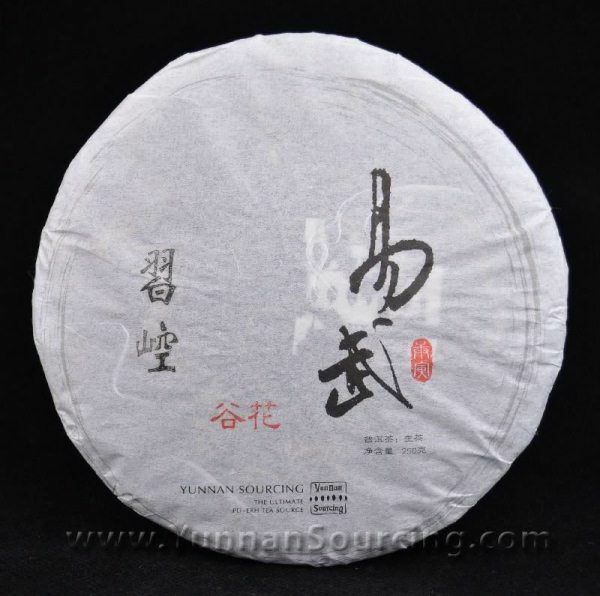 This cake came from 版纳古树茶 [Banna Gushucha, or "Xishuangbanna Ancient-Tree Tea"], a Taobao merchant, for 330 RMB ($53), which, after shipping, comes out to cost the same as the $60 cost at Yunnan Sourcing. The latter sold out almost immediately after our discussion! The leaves are surprisingly long and whole, and the cake is compressed neither heavily, nor loosely, but "just right", as shown below. 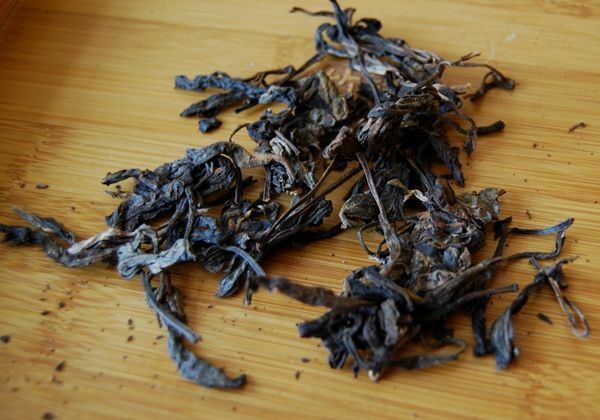 It is good tea - it has a tobacco-like sweetness that I thoroughly enjoy. While less potent than the purple-label cake and the "Laojie Yisheng" equivalent, which I described above, it is charming in its own way. The sweetness develops as the leaves unfurl to reveal a character of old honey. It's an excellent tea, and well worth buying if you have not yet tried it. While its contemporaries may trump it in terms of potency, it remains a good tea on its own terms, and is surely worth $53. Recently, I chuckled aloud (Wrapper Mayhem) at the seeming similarities between my old favourite, the 2005 Yisheng and a red-labelled cake from Yiwuzhengshan Tea Co. (makes of Douji). "Oh, you crazy Chinese chappies", I exclaimed to myself. 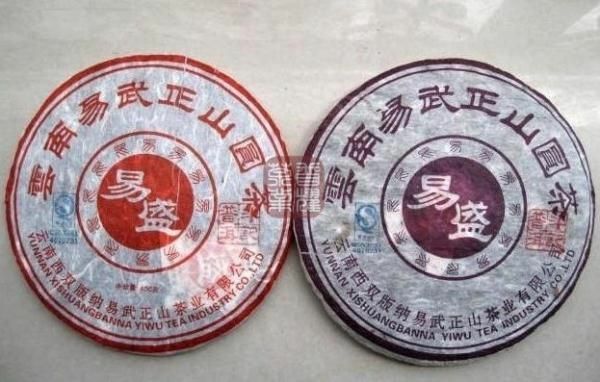 Yet, it appears consequently (from conversation with His Grace, Dr. the Duke of N, and from the Taobao descriptions) that these are, in fact, cakes from the same producer. This makes me happy, because I rather like Douji cakes - particularly the earlier varieties. Imagine, then, the dampness of my undergarments when I was informed that a purple-label "yisheng" (of the Douji variety) exists. This isn't what they usually mean by "spring and autumn"
Such is the way of things: Yunnan Sourcing, the merchant selling the cakes for a decent $60, promptly sold out of both cakes. C'est la vie. Fortunately, samples were still on offer, and a big box of samples generously provided by YS arrived at my office yesterday afternoon. This morning, I snuck a quick tea-session into the hour before breakfast. 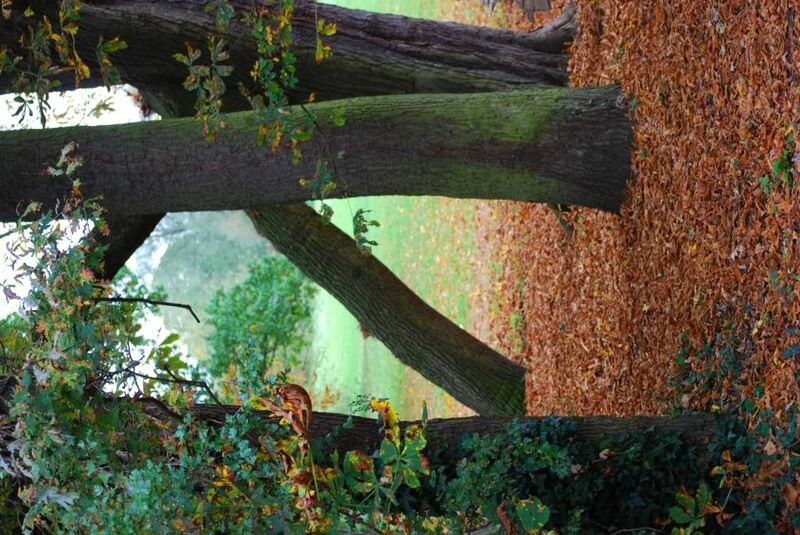 The leaves, as you can see for yourself, look rather good. While fragmented, they have an encouraging orangeness about them, while seeming well-defined and down-covered. 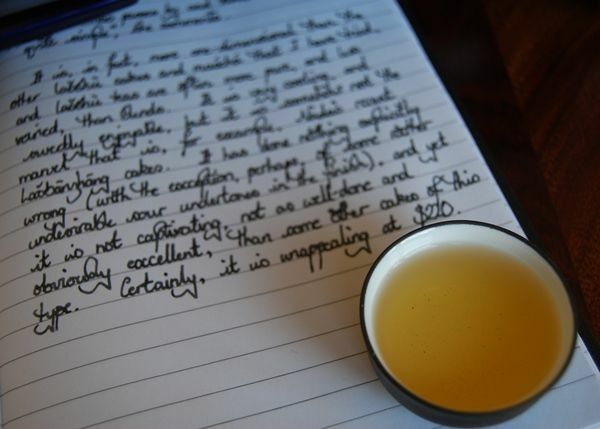 From the very first sniff of the wenxiangbei [aroma cup], my hopes are sustained: it offers a full, camphor-like scent that endures for long minutes, gradually evolving into a heavy, dark sweetness. 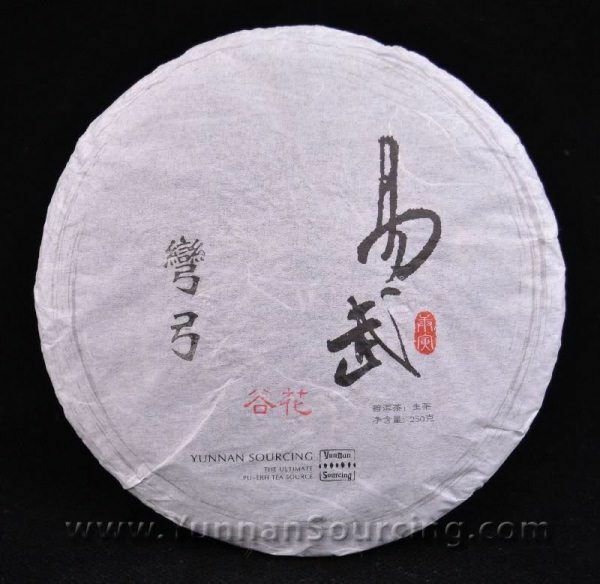 This is in marked contrast to weaker cakes, such as the recent 2008 Chenshenghao "Nannuo" - the Douji has some real backbone to its aroma, so to speak. It pours a straight orange that deepens as it sits in the gongdaobei [collecting jug, a.k.a. 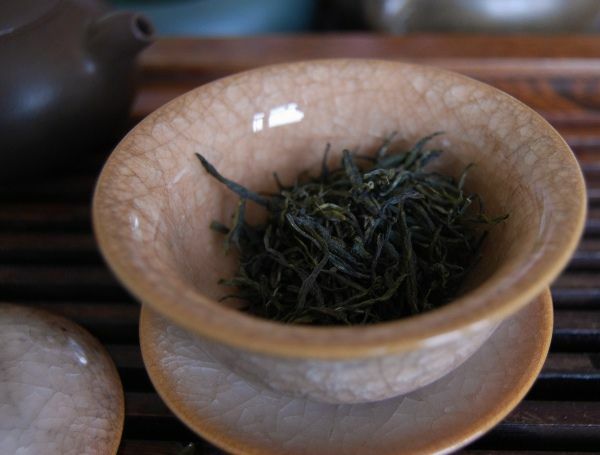 "fairness cup"], which indicates a good level of activity and life remains in the tea. Happily, the success story continues in the mouth: those camphor notes swell to dominate the tongue, combined with the hoped-for woody sweetness that comes with it's few years of age. 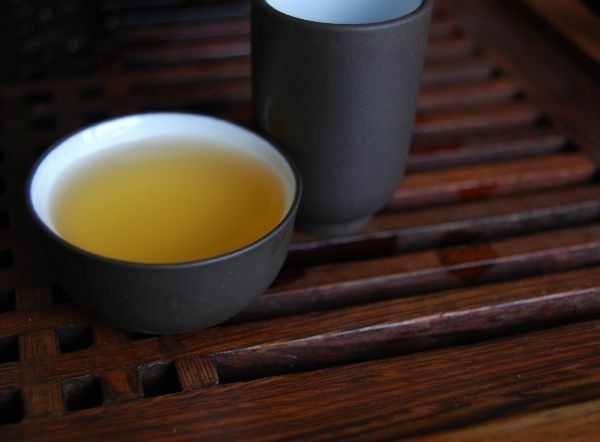 If you'll forgive some graphic detail, my mouth begins to water profusely as the tea sits in the throat, and its activity and decent quality can be felt in the pronounced cooling sensation left on the tongue. This is a solid cake. It is not the thickest soup in the world, but it is highly active and has plenty of energy remaining that suggests it should improve with a few more years. For future reference, I will err on the side of using more leaves, next time, as it appears to prefer a larger quantity. I am left feeling entirely calm, in the manner of a good tonic, and yet freshened. Thus, my next concern is where I might find some of this zippy little fellow. I turn to Taobao, and find that it sells for 350 RMB, which is around $53 - indicating that the Yunnan Sourcing price-tag was very reasonable. I will order a test cake and report my findings in due course. In the meantime, should you come across this purple label, I'd recommend having a go with it. 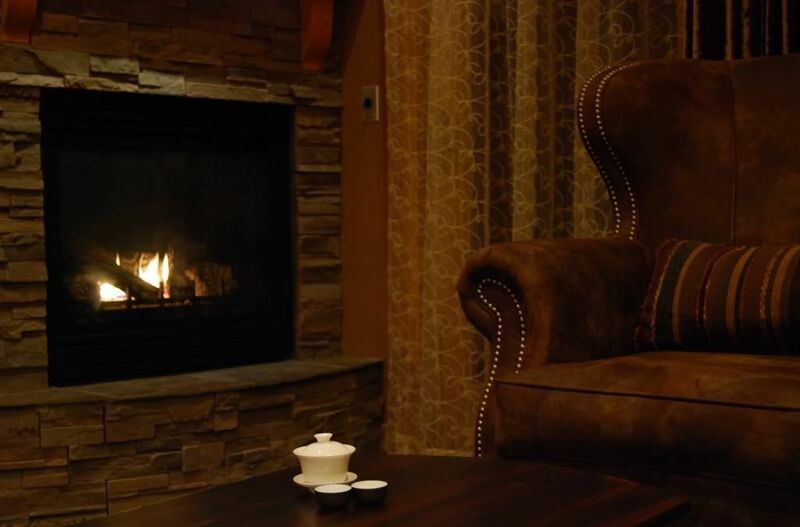 How often do you have proper tea sessions? That is, sitting down at the tea-table, and giving the tea your full attention, and "doing it properly"? 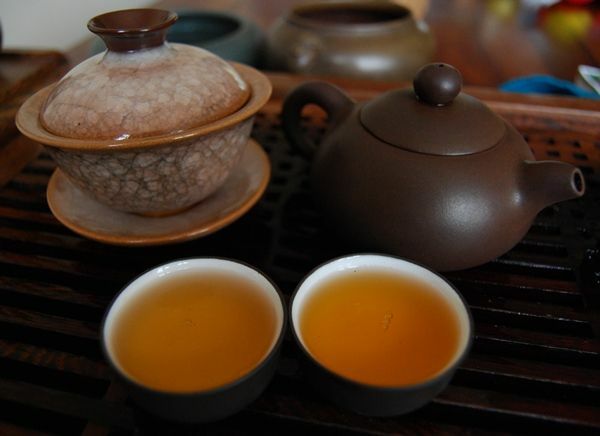 Sitting at the tea table becomes valuable time, which I appreciate greatly, perhaps for its increasing rarity. After a few deadlines have passed, I find myself with no early meetings on this weekday morning, and so convince myself that I deserve to have a delayed start, and enjoy a tea session instead of beginning my day early. Seeing as it's a weekday, I won't dig into something more precious. 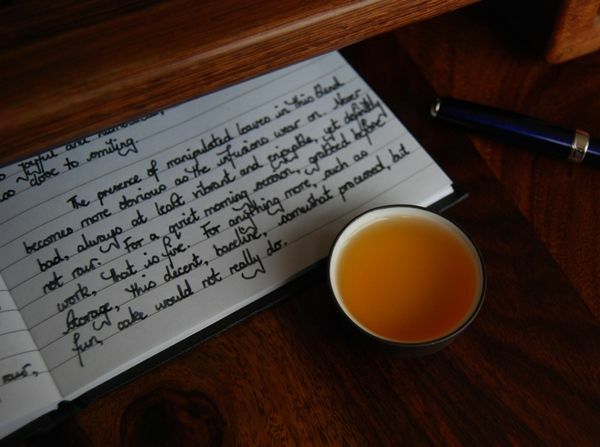 I leave older teas for those week-end morning sessions, where time is less tight. Today, I'm after a more down-to-Earth tea. 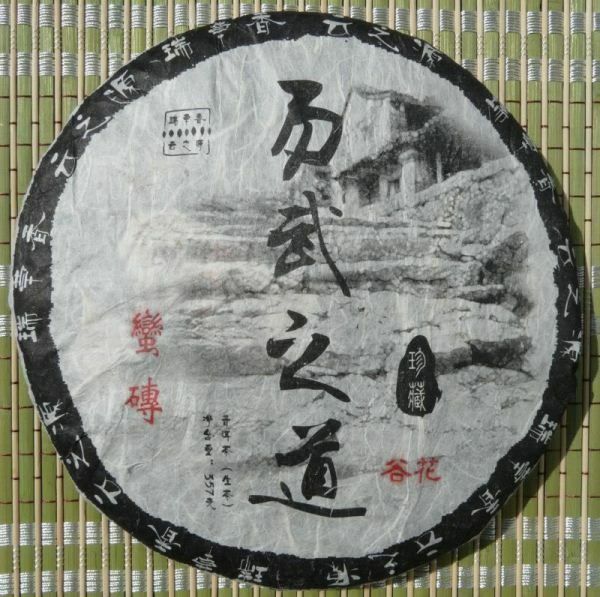 I select the 2008 Chenshenghao "Nannuo", a sample of which was generously provided by Jongky of Red Lantern. I appreciate the selection of Changtai productions at Red Lantern, and have written about many of them. My only previous article on Chenshenghao was the 2008 "Yiwu Dashu" [big tree], which I thought was a little tweaked and processed. Chenshenghao is one of Jongky's confessed favourite brands, and they do seem to look after their leaves properly. 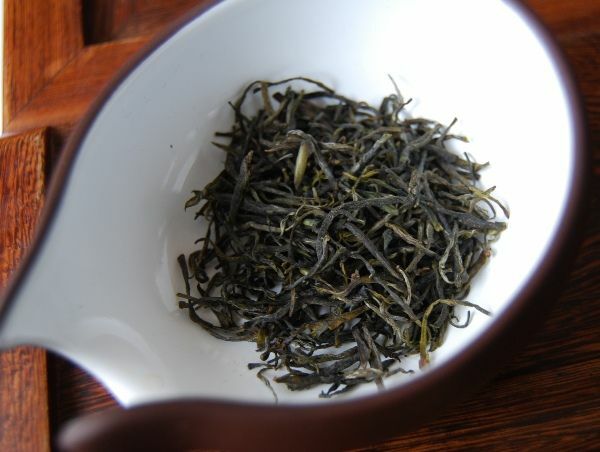 Shown above, the long leaves of the Nannuo cake are moderately compressed, and have a healthy shine to them. Do you detect a little redness in the leaves shown above? 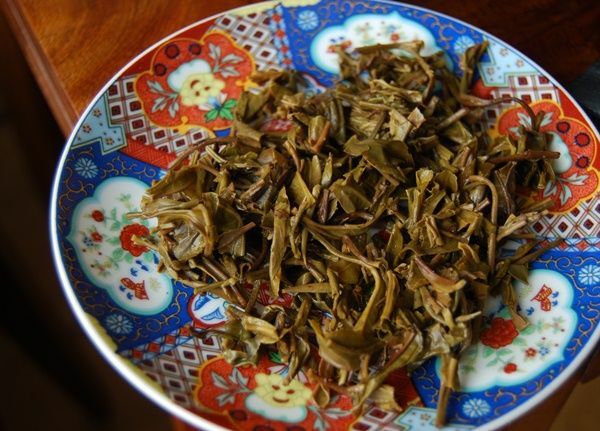 While some are good and green, there is a definite component of red leaves in the blend, which can be a reliable tactic for producers that are hoping to diminish the raw edge from maocha, and make things a little more accessible. The soup isn't as orange as the above photograph would have us believe, but it isn't yellow. The mixture of raw and red leaves is obvious in the aroma (clean sweetness + an additional caramelised component), and in the mouth (fresh, floral, grainlike rawness, with kuwei + a rounded, darkened addition to the back end). 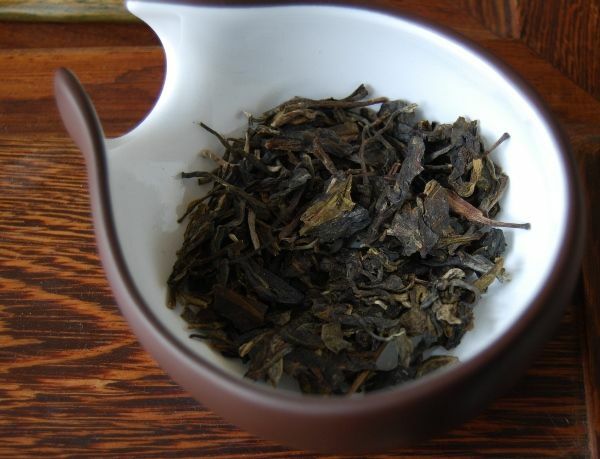 The presence of manipulated leaves in this blend becomes more obvious as the infusions wear on. Never bad, always at least vibrant and enjoyable, it is definitely not raw. For a quiet morning session, grabbed before work, that is fine. For anything more, such as storage, this decent, baseline, somewhat processed, but fun, cake would not really do. At $25, it is priced just about right. If you have room on your shelves for a potent, ever-present, interesting drink-it-now tea, this is a well-priced example that I found to be satisfying enough. 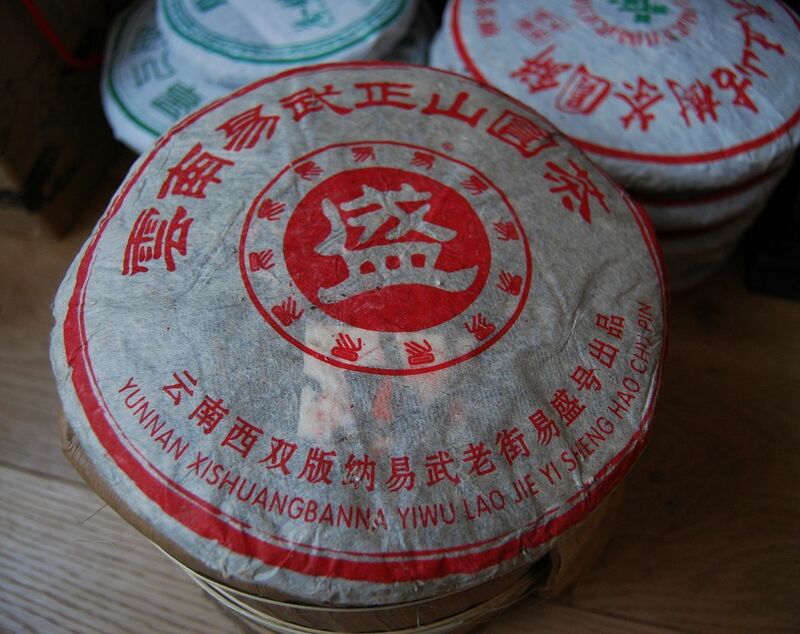 If, like me, you have enough of that particular type of puer'cha, then these are not the droids you're looking for. 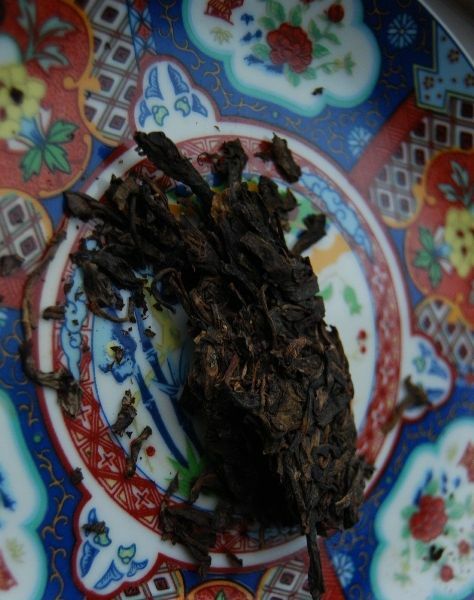 1999 Chen Guanghetang "Yiwu Longma"